Prevent all combat damage that would be dealt to Guard Gomazoa. 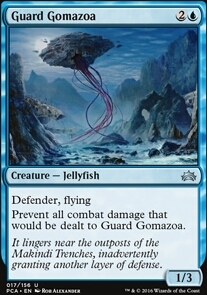 I'd cut both Fog Bank and Guard Gomazoa as you have enough creatures to do some blocking and their abilities don't really progress your strategy. 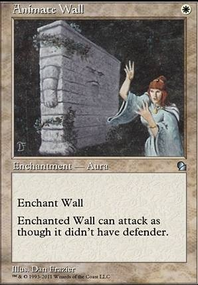 Spellskite can be an early blocker for you [which is really all those walls are for] and it can protect your commander from targeted removal. Sigil of Sleep doesn't seem very useful as you're not really going to be attacking that often. When you do attack it will be with a million locust tokens and then the opponent is just dead. I'd file it under the 'too cute' category. 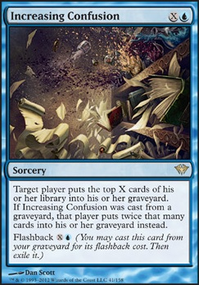 Psychic Corrosion is something that I would consider a bit corner as you're trying to kill them with damage from drawing cards, not mill them out. Is this meant as a backup plan? Day's Undoing and cards like it are nonbo with it as they shuffle graveyards back into libraries. Cut one Fork effect as hopefully Mirari lets you do all the duplicating you want. You should be seeing a lot of cards every game, the odds of you seeing more than one each game is already good. Wild Ricochet would be my choice simply because of the mana cost. 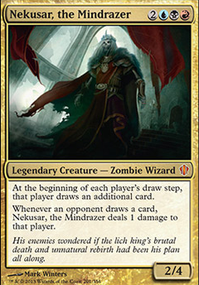 However, you may want both Lightning Greaves and Swiftfoot Boots in the deck as you can expect a ton of hate coming your commander's way. If you've played the deck a bit, how well has Torment of Hailfire performed? Typically I've seen it in decks that can produce a ton of mana but this deck doesn't really do that. 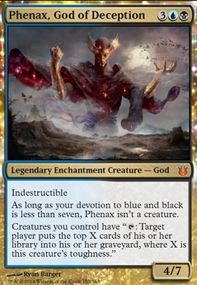 Is Nezahal, Primal Tide in there simply for the hand size text? If so, probably not worth the card slot, you have at least 3 other cards that do that which should cover it. I'll admit, after a couple glasses of merlot, not coming up with any more nuanced cuts, but, hopefully this has been some help. The commander definitely makes this deck work. Quick question though, how do you feel about Guard Gomazoa? Sure, it's just a defender with only 3 toughness, but it has "prevent all combat damage to this creature." Oh, and flying. It'll never die, except by burn spell or removal. Any ideas are much appreciated! Fun deck. +1. Overgrown Battlement will ramp like crazy. Axebane Guardian will ramp like crazy, too, while also mana-fixing. Battlement is almost certainly better than Vine Trellis. Guard Gomazoa also comes to mind as a good beatstick blocker. Given your combo revolves around a creature and an enchantment, Commune with the Gods might be a good fit here. Ornithopter doesn't seem particularly wonderful here. Perhaps Traproot Kami would be better, especially with Harvest Season. I'm not sure why the other dragons are in this deck - there doesn't seem to be much synergy with them. 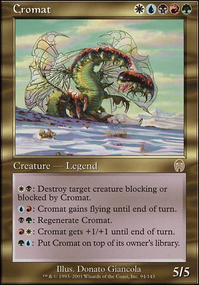 Maybe things like Soramaro, First to Dream, Myojin of Seeing Winds, Kami of the Crescent Moon, Guard Gomazoa, Vortex Elemental, Archetype of Imagination, and Howling Golem would ramp up the synergy a bit more? 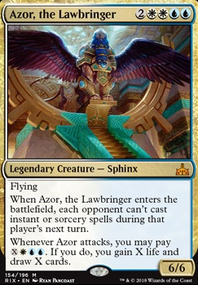 Possible cards to add: Island, Wall of Mist, Orator of Ojutai, Nivix Barrier, Monastery Flock, Jeskai Barricade, Geist of the Archives, Dragon's Eye Sentry, Doorkeeper, Sylvan Caryatid, Profaner of the Dead, Triton Tactics, Abzan Beastmaster, Bastion Protector, Lightning Greaves, Kindred Boon, Kindred Summons, Valorous Stance, Dive Down, Mizzium Skin, Sight of the Scalelords, Guard Gomazoa, Gomazoa, Hover Barrier, Spectra Ward, Whispersilk Cloak, and Oblation. Cards to pull: Primeval Bounty, Darksteel Ingot, Aura Mutation, Blue Sun's Zenith, Devouring Light, Essence Scatter, Glint Chart a Course, and Wall of Forgotten Pharaohs. That's about all I got for now. Basically, more creatures, keep Arcades safe, better cards. There are more cards that are pullable too but the ones above really should go at the very least for more creatures. Pass the message along. MrManlyMagikarp on Wait, Mill What Now?